Finally! If you’re anything like me, you’ve been waiting for The Simpsons on the big screen forever. If the world were a perfect place, the movie would come out today, but alas, the world is flawed. So I will wait with eager anticipation until July 27, 2007. All the Simpson’s characters voices are done by only seven people. The animation is done to fit the voices, rather than the more common technique of mixing the voices to the animations. It takes 6 – 8 months to make each episode. All of the Simpsons middle names start with J.
Marge’s hair was based on how Matt Groening saw his mother’s hair when he was younger. 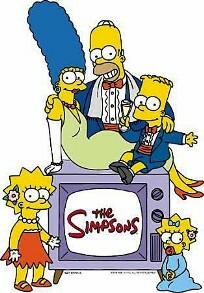 The creator of the series, Matt Groening had a hair cut like Bart’s when he was younger. On January 14, 2000, The Simpsons received a star on the Hollywood Walk of Fame. previous post: Star Jones Looks Horrible! 48 queries in 2.294 seconds.